[Is it true that this is a case where Jamie Oliver the person is better known than his food? Perhaps. If you have not heard of Jamie Oliver (or James Trevor Oliver), he is a British celebrity chef, restaurateur, cooking show host, cook book author, and campaigner against processed foods in national schools. He is somebody I personally look up to. And that if one day I am influential enough to advocate healthy food in Singapore’s schools, I will. 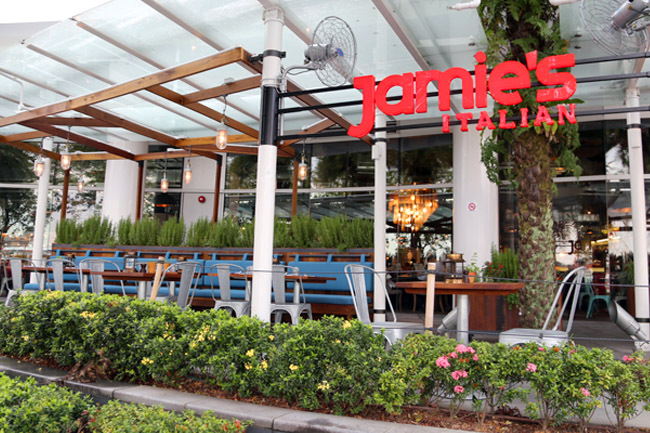 Jamie Oliver’s first restaurant in South-East Asia has opened at Singapore’s Vivocity. 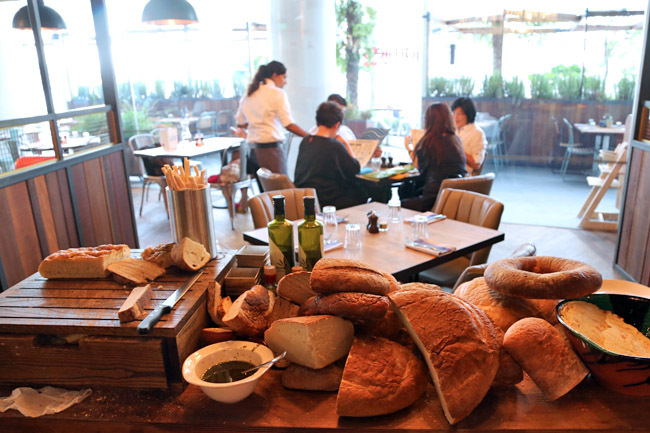 He is better known for his Italian dishes, many offered in this flagship store said to offer a taste of Italian traditions “peppered with twists of originality”. 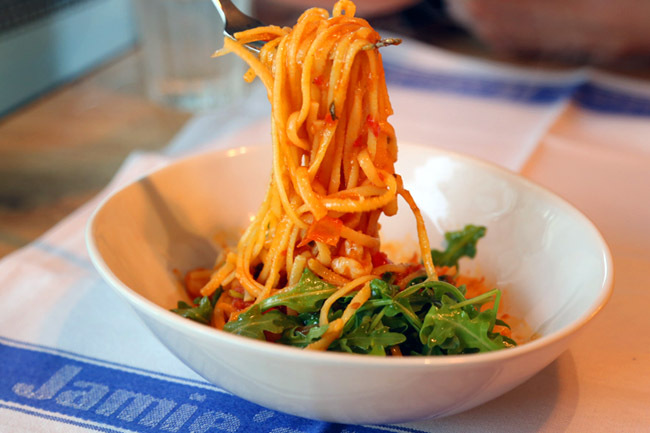 In line with Jamie Oliver’s beliefs, only free-range, sustainably sourced produce are used, and all pasta is made fresh daily onsite. I went during an off-peak hour and walked right in, though as I came out a long queue outside has formed. 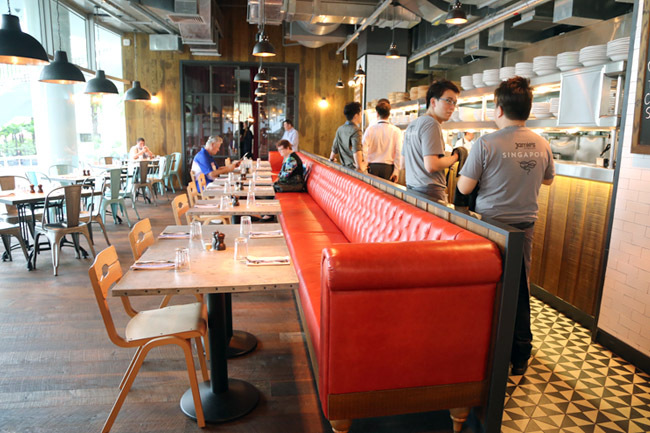 Online reservations are advised to be made via www.jamiesitalian.sg. 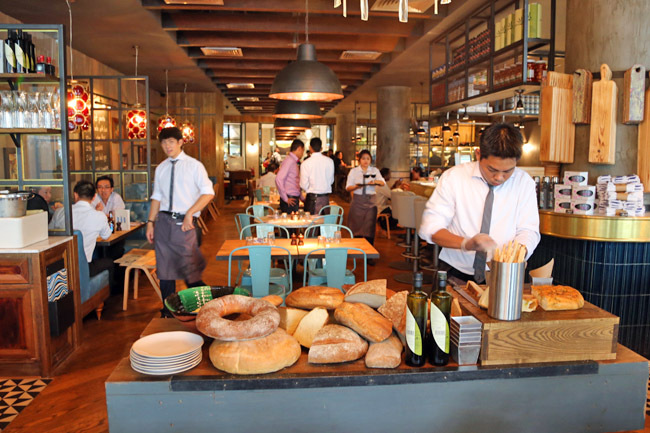 This new restaurant is buzzling of energy, a rarer side of Singapore where finding people to work in F&B service line is a huge challenge. There is a 100-man team, and thus this place is full of Jamie’s staff walking about, filling waters, serving dishes, checking on customers. Service was excellent, staff were definitely well-trained. No chi chi high end pretense, it’s lively-casual, Absolutely loved the enthusiastic spirited vibes. If there is no haze, try going for the 40-seat al fresco dining area facing Resorts World on the other side. 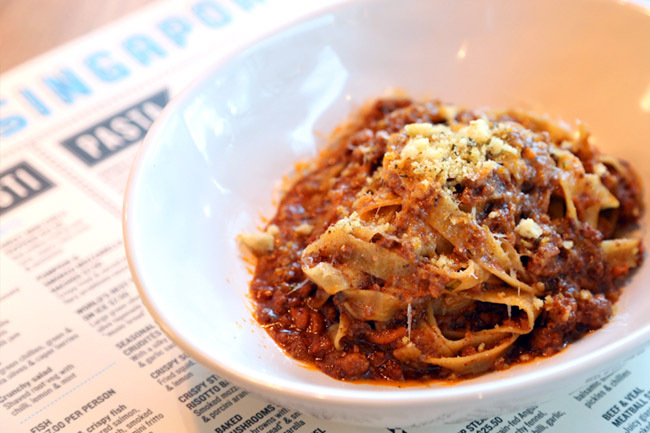 Recommended pastas include the Tagliatelle Bolognese ($15.00/$22.00), with beef and pork ragù and hints of Chianti and fragrant rosemary, and Prawn Linguine ($17.00/$25.00), with fried garlicky prawns and shaved fennel. The Tagliatelle Bolognese is easily the better tasting of the two, the minced meat evenly prepared not overpowering the pasta. You start to appreciate freshly-made pasta, still chewy but excludes that artificial springy bite. Better than average. Maybe it was expectations not met. I wished there were bigger prawns in the linguine. I wished the sauce was tangier. I wished it was a bigger portion (My fault, I ordered small though I finished in 4 quick successive bites.) I never imagined myself saying this at a Jamie Oliver’s, but I wished it was less oily. First bite off The Jamie’s Italian Burger ($27.50), I gave it a 10/10 – ohhhh, it was moist, juicy, huge, with a fragrant grain bun – I loved. Though on my subsequent bites, I noticed something amiss. Parts of the bun and wagyu steak patty were burnt, giving this slight ashy bitter savour which was really not satisfying. Save the best for last. 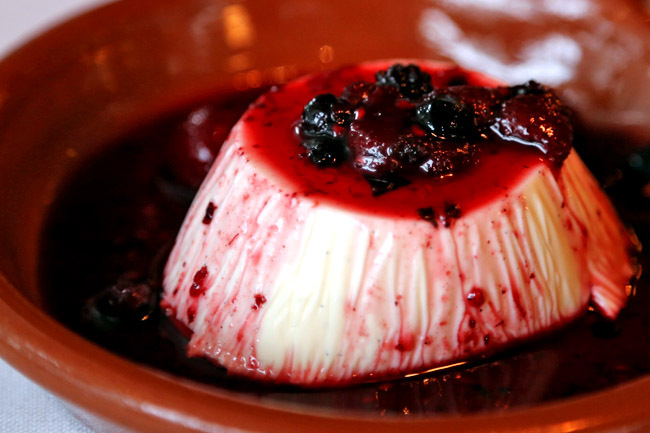 The desserts – a Creamy Panna Cotta ($9) with fruit compote and medley of berries, was easily one of the best locally I had. The texture was smoothly rich, sliding down the throat with the berries adding an oomph. You know what? It does not really matter if the food was not too perfect, and seemed rather underwhelming. It is Jamie Oliver! People will still come. I've been to his resto in Canary Wharf London & in Oxford and I must tell you, there's nothing to shout about in terms of food. I expected more. Oh well..
haha try to fit that burger in your mouth! good luck with that id say. 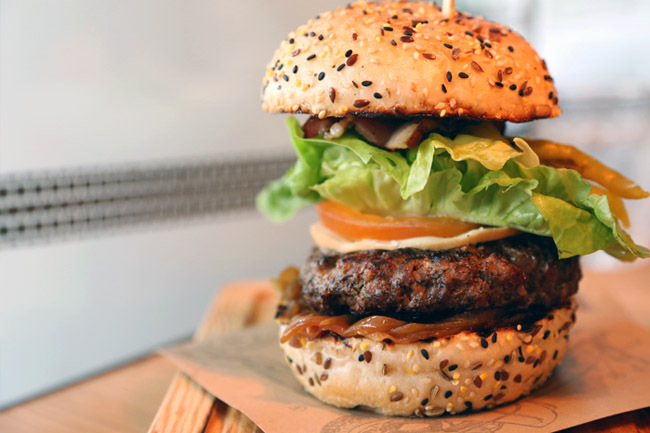 But Ill tell you what that burger looks amazing! And that bread oooh yum! I think what irked me most about Jamie's Italian is that it's fairly expensive for what is essentially, very average Italian fare. I love jamie's in london! disappointed to hear that about their prawn linguine, because it's my favourite dish in the london branch. I also love the brownies at jamie's in london, so I hope that the ones here are up to standard!